Black pudding is a type of blood sausage originating in the United Kingdom and Ireland. It is made from pork blood, with pork fat or beef suet, and a cereal, usually oatmeal, oat groats or barley groats. The high proportion of cereal, along with the use of certain herbs such as pennyroyal, serves to distinguish black pudding from blood sausages eaten in other parts of the world. The word pudding is believed to come from the French boudin, originally from the Latin botellus, meaning "small sausage", referring to encased meats used in medieval European puddings. Blood puddings are often supposed to be one of the oldest forms of sausage. Animals are generally bled at slaughter, and as blood does not keep unless prepared in some way, making a pudding with it is one of the easiest ways of ensuring it does not go to waste. While the majority of modern black pudding recipes involve pork blood, this has not always been the case; sheep or cow blood was also used, and one 15th-century English recipe used that of a porpoise, in a pudding eaten exclusively by the nobility. 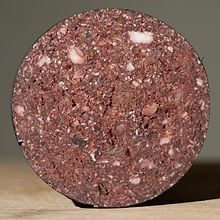 Until at least the 19th century, cow or sheep blood was the usual basis for black puddings in Scotland; Jamieson's Scottish dictionary defined "black pudding" as "a pudding made of the blood of a cow or sheep". As a product of the slaughtering process, eating black puddings was historically associated with Martinmas, when the annual slaughter of livestock took place. By the 19th century black pudding manufacture was linked with towns known for their large markets for pork, such as Stretford, then in Lancashire, or Cork, Ireland. By this time, black puddings were generally omitted from recipe books aimed at urban housewives, as they no longer usually had access to home-killed pork, although recipes appeared in Scottish books until the 20th century. Most traditional recipes from the United Kingdom involve stirring the fresh blood, adding fat and some form of rusk, and seasoning, before filling the mixture into a casing and boiling it. Natural casings of beef intestine were formerly used, though modern commercially made puddings use synthetic cellulose skins, and are usually produced from imported dried blood. The relatively limited range of ingredients and use of oats or barley to thicken and absorb the blood is typical of black pudding in comparison to Continental blood sausages. Despite this, black pudding recipes still show more regional variation across the country than other sausages, with many butchers having their own individual versions. Breadcrumbs or flour are sometimes used to supplement the oats or barley, and the proportion and texture of the fat or suet used can also vary widely. Pennyroyal, marjoram, thyme, and mint are all traditional flavourings: pennyroyal was known as "pudding-yerb" in the North Riding of Yorkshire for its use in black puddings. Other herbs and spices sometimes used in traditional black puddings include cumin, rue and parsley. While the dish has been known as "black pudding" for centuries, "blak podyngs" having been recorded in c.1450, a number of dialect names have also been used for the dish, such as "black pot" (in Somerset), and "bloody pot", particularly in reference to versions cooked in an earthenware pot rather than in a sausage casing. In the United Kingdom, black pudding is especially associated with the Black Country, the West Midlands, Scotland, and the North West of England: it is considered a particular delicacy in Stornoway and in Lancashire, notably in towns such as Bury, where it is traditionally boiled and served with malt vinegar out of paper wrapping. It was also found in Yorkshire, where black puddings were flavoured with lemon thyme and savory: Barnsley black puddings were particularly well-known. The Stornoway black pudding, made in the Western Isles of Scotland, has been granted Protected Geographical Indicator of Origin status. In the wake of this designation, butchers in Bury sought to demonstrate their history of manufacturing and selling the product. One such claim dates back to 1810. Having been brought there by emigrants, black pudding is now part of the local cuisine of the Canadian provinces of Nova Scotia and Newfoundland and Labrador. Black pudding is also widely available in supermarkets and butchers' shops in Australia and New Zealand, although is not as popular as in the United Kingdom and Ireland. In Ireland, in addition to the more general type of black pudding, there is a distinct regional variety called drisheen, which is particularly associated with Cork. Drisheen is usually made from cow's blood, although until the recent past it was often also made with sheep blood, and was sometimes flavoured with tansy. 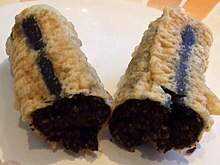 Black pudding can be grilled, fried, baked or boiled in its skin. It can also be eaten cold, as it is cooked in production. In parts of north-western England and in the Black Country it was usual to serve a whole black pudding boiled as a complete meal, with bread or potatoes, but elsewhere in the UK and Ireland slices of fried or grilled black puddings are more usually served as part of a traditional full breakfast, a tradition that followed British and Irish emigrants around the world. In Scotland and the north of England some chip shops sell deep-fried, battered black pudding. Novel culinary uses for black pudding include black pudding ice cream, while perhaps a more conventional modern recipe is using it as an accompaniment to scallops. Scotch eggs made with black pudding, such as the "Manchester egg", have become common. Black pudding is a good source of protein, is low in carbohydrate and high in zinc and iron. It has been described as a "superfood" because of these nutritional qualities, although many recipes are also very high in saturated fat and salt. ^ Olver, Lynne (2000). "The Food Timeline: pudding". Retrieved 3 May 2007. ^ "The Black Pudding". The English Breakfast Society. Retrieved 6 January 2014. ^ Paul Britton (10 January 2013). "Proof of black pudding's birthplace is back home in Bury". Manchester Evening News. Retrieved 12 March 2016. ^ "Marystown man enjoys making traditional Newfoundland fare". Southern Gazette. 15 October 2008. Retrieved 1 October 2016. ^ a b "Black pudding ice cream unveiled". 26 August 2005. Retrieved 21 March 2016. ^ "BBC Food: Scallops with bacon, black pudding and colcannon". Retrieved 30 September 2016. ^ Paul Vallely (19 November 2011). "Great Scotch! Manchester's take on the Scotch egg has become a snack sensation". The Independent. Retrieved 21 March 2016. ^ "Manchester egg recipe". The Daily Telegraph. Retrieved 21 March 2016. ^ "Blood sausage – Nutrition Facts". SELFNutritionData. Retrieved 7 January 2016. ^ Adam Boult (6 January 2016). "Black pudding hailed as a 'superfood'". The Daily Telegraph. Retrieved 6 October 2018. ^ "Ramsbottom World Black Pudding Throwing Championships". Retrieved 12 March 2016. ^ Paul Britton (7 September 2015). "The World Black Pudding Throwing Championships return to Ramsbottom on Sunday". Manchester Evening News. Retrieved 12 March 2016. ^ Dan O'Donoghue (14 September 2015). "PICTURES: Thousands flock to Ramsbottom for World Black Pudding Throwing Championships". Rossendale Free Press. Retrieved 21 March 2016. ^ Samrana Hussain. "A crack at world record". Lancashire Telegraph. Retrieved 21 March 2016.